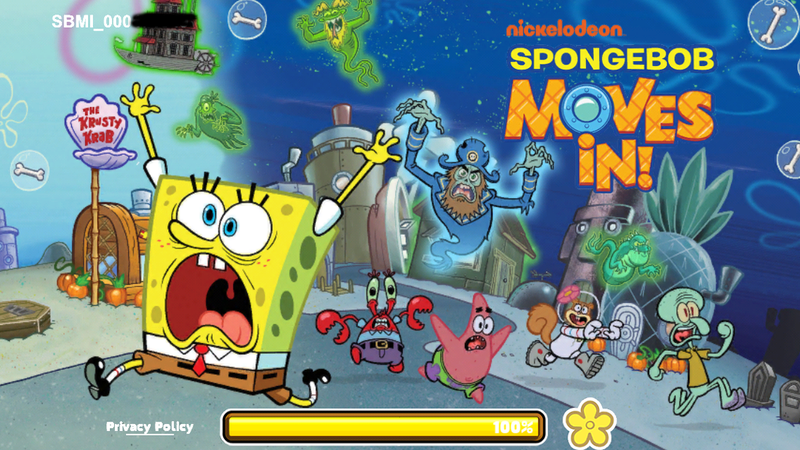 Halloween 2014 - The SpongeBob Moves In Guide Site! Nickelodeon released Version 4.20.00 of the game to the public on October 2nd, bringing with it not only an all-new event, but also tons of great new features to the game! 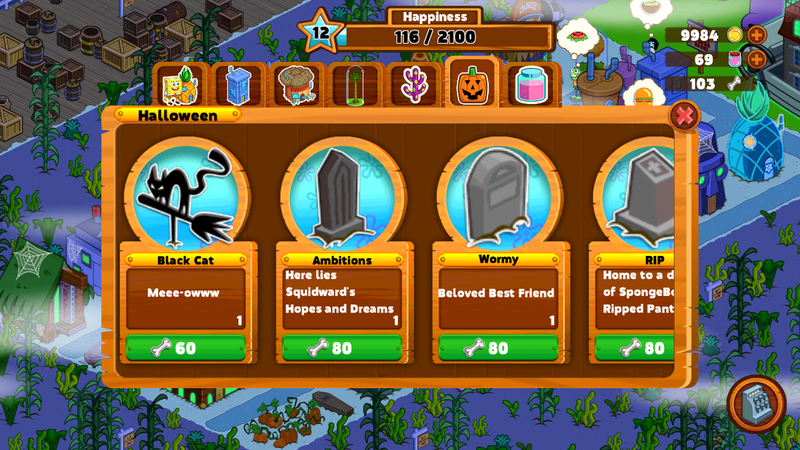 From spookifying Bikini Bottom, to having your characters complete tasks, there was a ton of new things to do. And it sure did make the game more fun than ever before! Although the event wasn't as big as the one held in 2013, it allowed us to have the Festivities of November, which really makes up for the shorter event! Nonetheless, scroll down to take a closer look at what goodies were released in October of 2014! Enjoy! Lord Poltergeist and his ghostly crew are "visiting" Bikini Bottom! You know what that means? No, it doesn't mean free ice cream. It means that your Bikini Bottom is now a haunting ground for a bandwagon of ghosts who are making themselves feel welcome by having SpongeBob feed them Driftwood and Specials from the "Rusty on Rye" restaurant and making them beds out of cobwebs! What might the reward be? Well, they'd be throwin' bones at ya. If you manage to complete the various quest-lines that Lord Poltergeist has, you might just score yourself some awesome Halloween Prizes! Even though this update does not feature the Community Event, there are plenty of pretty awesome additions to the game. We'll be getting into that in the next section. Also, we have a step-by-step Questline Guide with complete instructions on how to complete the various quests and get those awesome goodies, which you can visit by clicking here. Lastly, we have an extra section all about the items you can obtain a few sections down. Happy Halloween! The Characters are now Active! This Update brought more than just the Halloween Event. 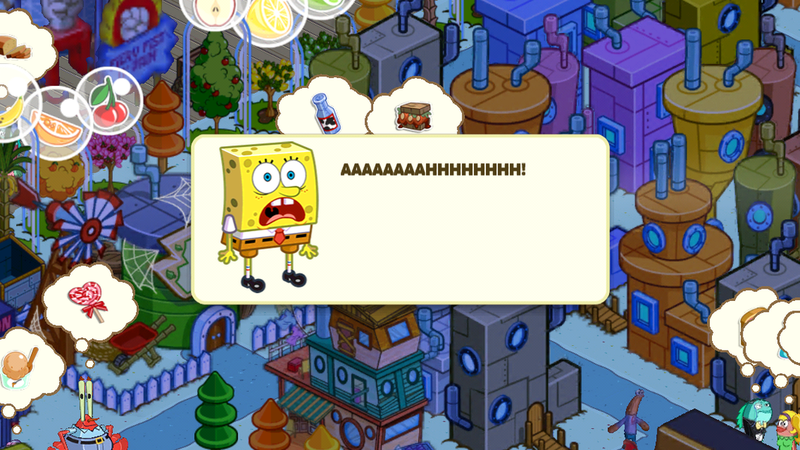 Characters now have the ability to do tasks, such as admiring art in the Fry Cook Museum, or visiting inmates in the Bikini Bottom Jail. Simply tap on the character that you want to have a task done, scroll down and select the task you want that character to do, and tap go. The benefits? Not only are there some awesome animations (currently only for SpongeBob), you get extra coins and XP! 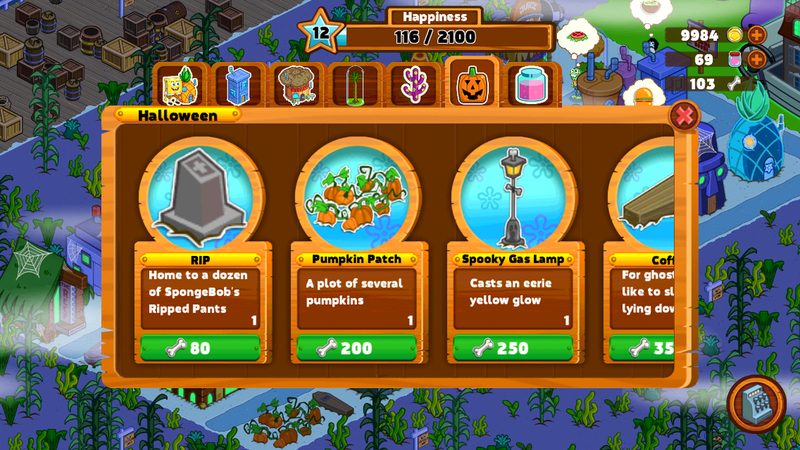 Also, while the Halloween Event is ongoing, get any ghost in your Bikini Bottom to do a task. Aside from the coins and XP you'll receive after the task is fulfilled, the ghost will also throw a huge amount of bones at you, which can range from 20 bones, to as much as 300 bones at once! Of course, the number of bones you'll receive from the character tasks will vary on the time taken to complete that task. Still, we recommend that you go for the long term tasks. You'll be able to rack up bones for purchasing decorations even faster! We have a new Character Task Guide that you can check out for a comprehensive list of tasks that can be done by each character, which you can view here. Go and have fun with the new feature! Move in the Rusty on Rye and the Barg 'n' Mart! 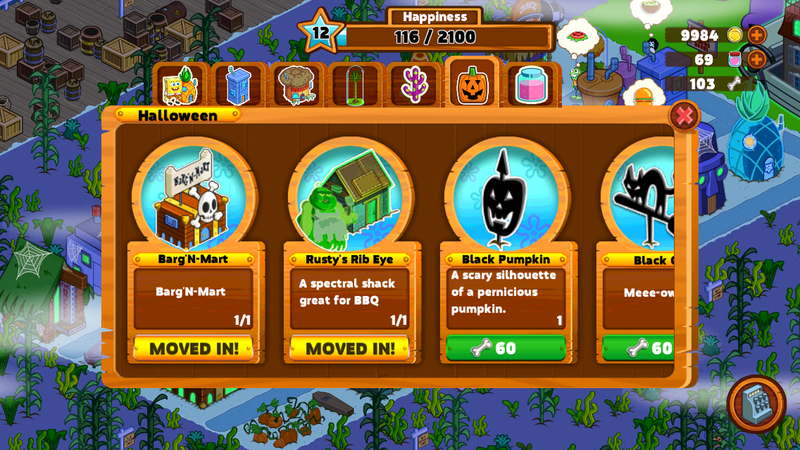 As part of this Halloween update, the opportunity to Move In the Barg 'n' Mart and the Rusty's Ribeye has returned! You'll need these two stores for the Halloween questline which requires you to make new Halloween recipes and serve em' to the ghosts who are inhabiting your town. There's plenty of really random items that can be found in the Barg 'n' Mart, including Marbles and Paint, of which does not have any purpose in the game as of this writing. 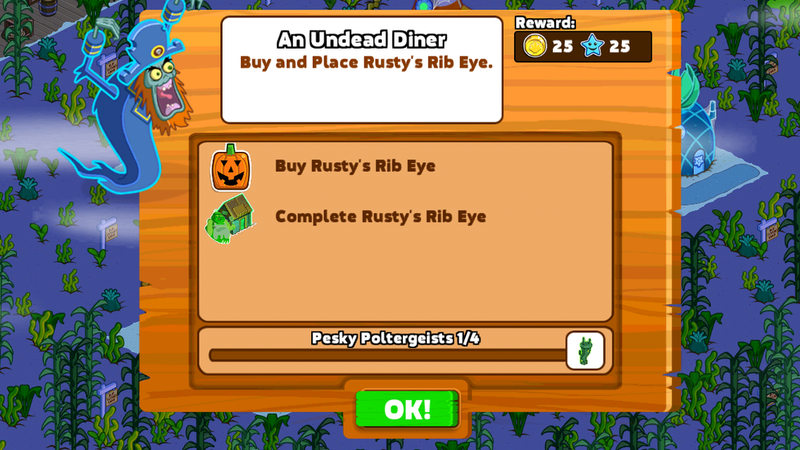 You can also purchase ingredients you'll need to make the Halloween delights in the Rusty's Ribeye. Well, what are you waiting for? Get cooking! Don't forget that you can use the bones collected from the Ghosts to purchase limited-time Halloween items from the store! As with every event, there are new items, all of which are limited-time only. Two items, the Seance Table and the Haunted Fish House can be obtained only via completing the two Halloween questlines. 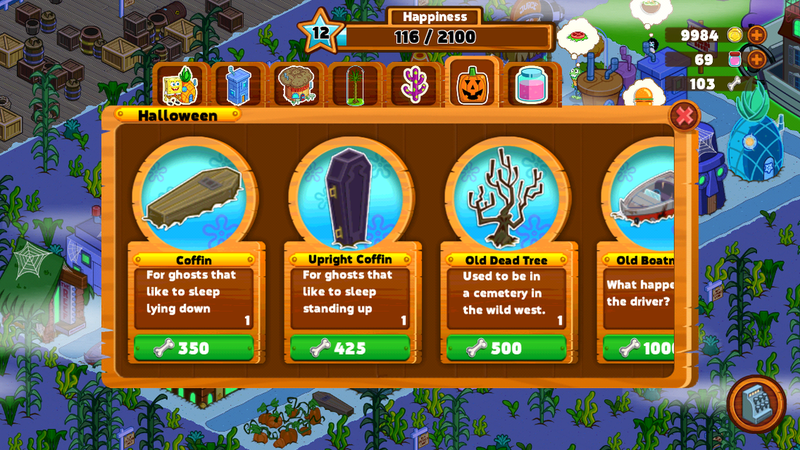 The rest, including gravestones and old dead trees can be found in the store, purchasable only by using bones that you can collect from feeding ghosts. Two exceptions are the Barg 'n' Mart and the Rusty's Ribeye, which can be moved in using coins. We have compiled a list of items available in the Halloween Store below, but you may also choose to refer to the screenshots above. Enjoy! Q: Does Halloween go away? 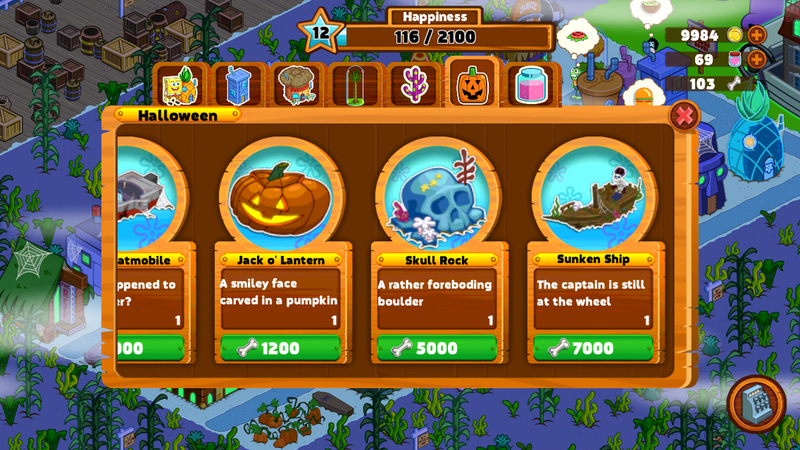 A: The Ghost Ship will be fixed by the end of Halloween and all the ghosts will depart. All bones and the Halloween store will be gone, so use up the bones before the event is over. All purchased decorations and collected decorations will remain except the ghost ship at the end of the event. Q: Halloween will not last forever, what about the Decorations? A: The Halloween decorations are only available for a limited time to purchase, any limited edition items purchased or received from a reward will remain in your Bikini Bottom after the Halloween event is over. Bones and the Halloween store will disappear, so make sure and get your special items before the event is over! Q: I can’t complete the Séance Table quest. What should I do? A: You can now send players on tasks, tap on a character to bring up their task and costume menu. The séance table requires the player to select the task in SpongeBob's list of tasks. Tap SpongeBob and in any costume he will have the option "Perform Séance". Tap the action and SpongeBob will head to the Séance Table to perform the task. Make sure SpongeBob isn't currently doing a task already, otherwise you can't send him to perform the séance task until the task is over. Q: What are Bones? How do I get them and what are they for? A: Ghosts pay for their treats with bones, which can be used to buy things in the Halloween store for the Halloween event. After the event is over, the bones will disappear along with the ghosts, so make sure to spend them before they are gone! Q: What can I do during the Halloween event? A: Celebrate Halloween in SpongeBob Moves In with a new costume feature, tasks and ghostly activities by updating to the latest version in the app store! 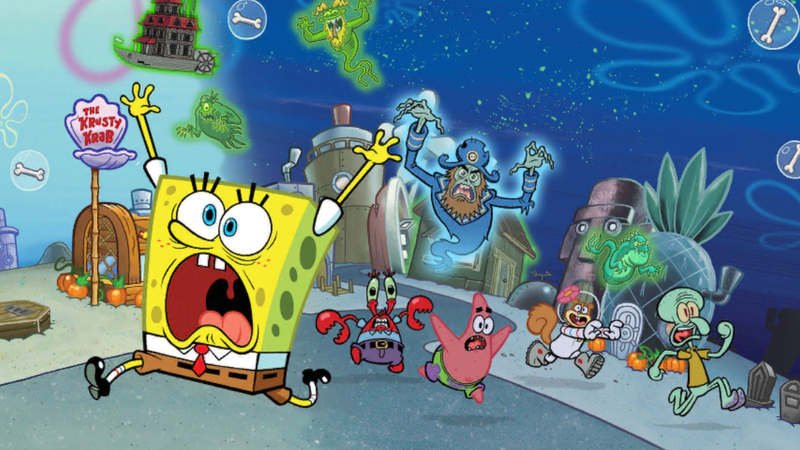 A ghost ship has crashed into Bikini Bottom and brought with it a demanding ghostly pirate crew. Move in the Barg'N-Mart along with Rusty's Ribeye, feed the ghosts and collect bones to decorate your Bikini Bottom with spooky decorations. Completing Halloween quests will unlock the special Mermaid Man costume for SpongeBob only obtainable by playing through the Halloween quests. Hurry before everything disappears along with the ghosts at the end of the Halloween Season. Q: Where can I find Driftwood? 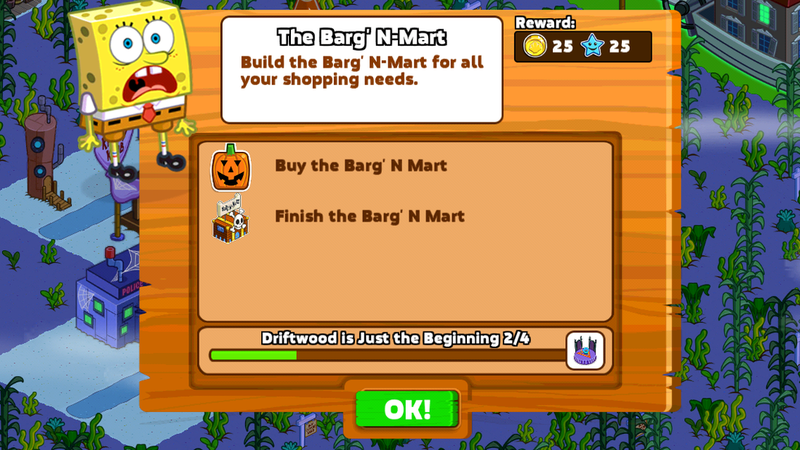 A: Driftwood can be purchased in the Barg'N-Mart for coins or collected in the town. The driftwood will be spawn into Bikini Bottom in random places after a certain length of time, so come back often to collect more driftwood to keep making food for the ghosts.